Polling released within the past 24 hours suggests that Mitt Romney has stopped and possibly reversed Newt Gingrich’s momentum before the Florida primary on Tuesday. The FiveThirtyEight forecast model still projects Mr. Gingrich as the slight favorite in Florida, giving him a two-point lead and a 60 percent chance of victory. 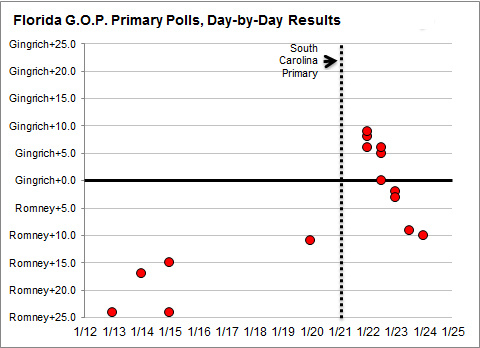 However, this lead is diminished considerably from two days ago, when the model saw a potential double-digit win for Mr. Gingrich, as polls released immediately after the South Carolina primary had him surging in Florida. In fact, I suspect that the model is being too conservative and that there is enough evidence — when you look carefully at the day-to-day results — to conclude that Mr. Romney has re-emerged as the slight favorite in Florida instead. The complication in Florida is that there are two conflicting trends. It should be quite obvious that Mr. Gingrich’s position is much stronger than it was before Jan. 16; after his strong performance in a debate in Myrtle Beach, S.C., that night, s support began rising sharply in state and national polls. However, it looks as though Mr. Gingrich’s surge may have reached its apogee over the weekend — timed perfectly for his big win in South Carolina, but not necessarily for one in Florida next week. The chart below probably does the clearest job of telling the story. It shows the results of all recent Florida polls based on the dates the poll takers were in the field. Often, this includes more detail on the day-by-day breakdowns than is available from the poll’s top-line results, based either on additional information published in the pollster’s cross-tabulations or detail that the polling firm made available to FiveThirtyEight. In the chart, you see Mr. Gingrich gaining on Mr. Romney over the course of last week — and then surging ahead after his win in South Carolina. However, since the weekend, Mr. Gingrich appears to have lost ground on Mr. Romney with each passing day. Visually, it seems quite obvious what is going on, and there is a lot to be said for that. Pattern recognition is one of those things that our brains tend to be pretty good at — better, usually, than computer algorithms. On the other hand, there is some information that this chart disguises that something like the FiveThirtyEight forecast model picks up on. For instance, the CNN poll released on Wednesday showed Mr. Gingrich performing much worse in the interviews it conducted on Monday and Tuesday — when he trailed Mr. Romney by nine points — than in the ones it conducted on Sunday, the day after his South Carolina win, when Mr. Gingrich led Mr. Romney by six points instead. However, the sizes of these subsamples are tiny — CNN interviewed 369 voters in total, and dividing them up in this way yields margins of sampling error in the range of about 7.5 percentage points. In contrast, some of the polls released on Sunday and Monday had considerably larger sample sizes. Another pollster to show this kind of shift — the American Research Group — has performed well this year in the first three early-voting states. But its overall track record has been quite mixed. Because the model considers things like a firm’s track record and the sample size of a poll in addition to the field dates, it’s not quite persuaded that the short-term trend over the past 48 hours is enough to outweigh the medium-term trend toward Mr. Gingrich, for which there is less ambiguous evidence. Meanwhile, some of the anecdotal evidence still seems quite favorable for Mr. Gingrich: he has drawn much larger crowds than Mr. Romney to his events in Florida, for instance, which could be a sign that his voters are more enthusiastic and more likely to turn out. Still, I think the model is being too stubborn in this instance, and this is one of those times I would probably bet against its forecasts. It is not as if all of this is happening in a vacuum: there was a debate, for instance, on Monday night, and although both pundit reaction and polls of debate watchers suggested that it was more or less a draw, Mr. Romney may have done enough damage on Mr. Gingrich’s ties to Freddie Mac and his resignation as House speaker to raise fresh doubts in voters’ minds about his candidacy. Another piece of context is that the polls have been unusually volatile all year, perhaps because of the way the news cycle is changing and speeding up. The model uses data going as far back as 1980 to calibrate its results. Perhaps back then, it would have been appropriate to be skeptical that Mr. Gingrich could lose his momentum so quickly — especially when this evidence is based on polls with limited sample sizes or mixed track records. But we may be living in a different world now. And yet, that volatility suggests that even if Mr. Gingrich has lost the momentum, he might easily regain it again — for instance, if he performs well at the next debate on Thursday.